SmallsLIVE was designed to offer listeners without easy access to the Greenwich Village club the opportunity to experience the atmosphere without the travel expenses. 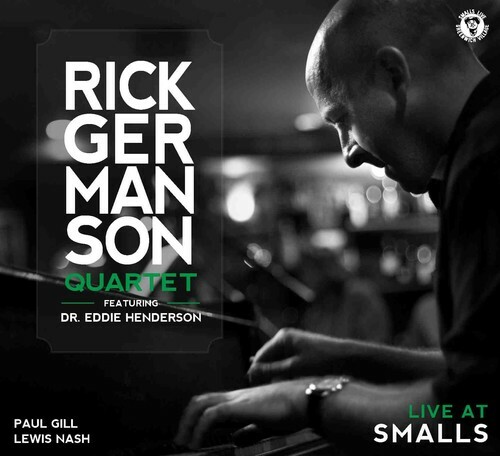 Pianist Rick Germanson fully embraces that mission, offering a rough-hewn, feel-over-finesse set of hard bop that will have you getting up off your couch to head for the bar. The quartet leaps right in with Bobby Timmons' "So Tired, "driven by the propulsively grooving rhythm section of bassist Paul Gill and drummer Lewis Nash and highlighted by Dr. Eddie Henderson's gutsy solo. Somehow the chattering and glasses-clinking crowd enhances the feeling of relaxed camaraderie on "Surrey With the Fringe on Top," with Germanson playfully goading Henderson during the trumpeter's muted solo before spinning his own variations on the familiar melody. That alternation of the blazing and the blissful is maintained throughout, as when the yearning "Shorter Waltz" is followed by the dark-cloud ferocity of "Interloper." The opener, "Quagmire," will hook you as pianist Rick Germanson, known mostly for his work as an accompanist or sideman, steps up and exhibits strong solo chops. "Quagmire" is high energy, but its' energy is carefully budgeted and spent. It's pouring out of Germanson as the primary soloist, but solid and restrained from master drummer Louis Hayes who sticks to brushes on this one. Bassist Gerald Cannon, an essential element throughout, is impeccable. On "Daytona," Cannon gets solo space and delights with his improvisation. Balancing his program between the fiery and ballads, "Up Jumped Spring" on the ballad side is a pretty rendition of a too seldom heard tune. His 8:20 treatment of "Autumn in New York" is a patient interpretation of an all time favorite. Pianist Rick Germanson steps out with his third hit, Off The Cuff, after several years as sideman to many jazz elites. Bringing with him bassist, Gerald Cannon and drummer Louis Hayes, proves a solid team effort as the trio brings feeling and intensity to their stellar musicianship. Opening with "Quagmire" seems almost deceptive as these artists work their way fluidly through this up-tempo, keyboard driven, brushwork-laden tune. Calling Cannon a main mentor during his formative years, Germanson says "Gerald put together a quintet called the Jazz Elements back in Milwaukee, featuring local legend Berkely Fudge on tenor," giving Germanson tremendous experience gigging in Milwaukee and New York. This fifteen year relationship has definitely paid-off for both artists. "There is plenty of room on this song for each artist to showcase his own stellar craft, while melding with the other musicians." Written for Germanson's late sister, "Jill's Song" is an introspective piano solo developing into a waltz-time ballad. The familiar "Wives and Lovers" displays Germanson's strength on keyboard as Louis Hayes maintains an outstanding one-ness on drums, brush and symbols. Introspective, "Up Jumped Spring" sets a tone of peacefulness. "The Way of Water" features a cascading piano solo before the presentation of "Autumn in New York," both gentle, almost playful in trickling, caressing notes. Smooth, meandering walks along an autumn pathway to the divine offerings of nature. Cannon's bass is rich, deep and timely. Drummer, Louis Hayes is a member of the original Cannonball Adderly Quintet and has worked with Germanson over the course of several years. No wonder their sound is so cohesive. "Brick" shows just how experienced these musicians are with each other. Hayes' drum work is strong and solid but does not drown out the feverish finger work of Germanson on keyboard during this fiery composition. Giving the listener time to catch up with the feel of this album, "Any Thoughts?" closes the CD, Not too racy. Not too tame. There is plenty of room on this song for each artist to showcase his own stellar craft, while melding with the other musicians. Owl Studios has consistently added amazingly talented musicians to their ranks. Rick Germanson, Louis Hayes, Gerald Cannon and Rob Dixon add another dimension of excellence with the production of Off The Cuff. The term "Milwaukee's Best" probably doesn't have the positive connotation that it should, thanks to that being the name of Miller Beer's economy brand. But when it comes to musicians, there's plenty from this fine Wisconsin city to be proud of, from Woody Herman and Al Jarreau to Daryl Stuermer and Hubert Sumlin. And that's not even including soon-to-be-stars like Ethan Keller. With the release this week of Off The Cuff, pianist/composer Rick Germanson leaves us no choice but to include him on that lofty list, too. Germanson, like all up-and-coming, talented jazz musicians from the world over, moved to NYC in his mid-twenties, firmly establishing himself with stints in the bands of Pat Martino, Eddie Henderson, Frank Morgan, George Coleman, Elvin Jones, Jimmy Cobb and Cannonball Adderly's best drummer, Louis Hayes. "...reaffirms the continued vitality of piano/bass/drums in hard bop jazz, adding grace and muscle in equal helpings." In this his third album, Germanson once again employs that tried-and-true trio format. It's a getup that works well only if you have good chops, good compositions and a sympathetic, strong rhythm section. Germanson has all three bases covered for Off The Cuff. For his bassist, he chose Gerald Cannon, a veteran of bands led by McCoy Tyner, Elvin Jones, Roy Hargrove and Steve Turre. And on drums, he rounded up his boss in the Cannonball Legacy Band, the badassed Hayes. Like the Kait Dunton or Steve Allee records we covered in this space, Germanson also reaffirms the continued vitality of piano/bass/drums in hard bop jazz, adding grace and muscle in equal helpings. He also mixes up the mood so that one never gets the feeling that it's just one long song being played at varying keys and tempos. "Quagmire" kicks off the album on a crisp footing with a tightly-constructed hard-bop melody. The first thing that gets noticed is Hayes' world-class brushwork. But when Germanson launches into a solo, there's little doubt as to whose date this is; his brisk, lyrical lines show the imprint of both Bill Evans and Kenny Barron. And then right after that, Germanson uncorks a beautifully winsome ballad, "Jill's Song." "Daytona," showcased by a bouncy bass solo from Cannon, is a relaxed, pleasing bossa nova. "The Way Of Water" is Germanson alone, a moving and moody piece that incorporates fastidiously conceived classical elements, wisely favoring the beauty of the song over some crowded clusters of notes. The high-strung "Brick," however, is the place for the boys to show us what they've got. Hayes does most of the talking on this relatively brief burner, taking explosive but tasteful solos near the beginning and the end of the tune. Germanson's best composition comes at the end of the record, the slippery and snappy "Any Thoughts?". Germanson threw in a few standards for good measure: an elegant and sensitive reading of Freddie Hubbard's "Up Jumped Spring" was recorded only a couple of weeks after Hubbard's death and makes for a touching tribute to the great trumpeter. It's also hard to find any fault with this combo's treatments of "This Time The Dream's On Me," "Wives And Lovers" and "Autumn In New York." Flawlessly produced by Rob Dixon, Off The Cuff is yet another winner by the Owl Studios label, and hit the streets on June 9. You owe it to yourself to taste some of Milwaukee's Best...music, that is. Jazz pianist Rick Germanson mesmerized the audience for 90 minutes last Friday at a sold-out concert at Brookfield's Wilson Center for the Performing Arts. A 34-year-old Milwaukee native who has resided in New York for the past 10 years, Germanson was backed by bassist Jeff Hamann and drummer Brian Ritter. Germanson's playing draws upon the hard-bop and soul-jazz styles popular in the 1950s and '60s. He makes frequent use of block chords, evoking the sound of Red Garland, the pianist for Miles Davis' late-'50s quintet, and his use of gospel and blues chords calls to mind Bobby Timmons, pianist for the Jazz Messengers, so it was fitting that the first tune of the evening was Timmons' soulful "So Tired." Several standards were given a fresh treatment, including George Gershwin's "Love Walked In," Harold Arlen's "Blues In The Night" and Duke Ellington's "Satin Doll." A song popularized by Frank Sinatra, "It Was A Very Good Year," was given a smashingly strong reprise. Germanson also played a couple of excellent original compositions. "Game Theory" is a hard-driving modal number, recalling the songs of pianist Cedar Walton, with Germanson following clusters of notes with rapidly ascending and descending single-note lines. "In the Cut" is solidly in the Bobby Timmons/Junior Mance soul piano tradition, complete with call and response block chords. Just before the fiery finale, Germanson slowed things down with a couple of ballads, "Somewhere Over the Rainbow" and Burt Bacharach's "The Look of Love," which were played with plenty of soul and rhythmic variety. Germanson doesn't just absorb the styles of great jazz pianists from an earlier era; he infuses those styles into old and new compositions to create music that is fresh and exciting. "The presence of the excellent Rick Germanson on piano upped the ante, powering several sustained passages of earthy, hymnal collective energy." 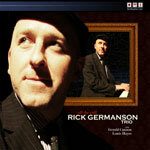 "The pianist Rick Germanson, a gifted musician...a talent to watch. He took some incredible solos, using identifiable classical and jazz pianistic motifs that he then developed through repetition and variation into a virtual kaleidoscope of musical elaborations that were both unique and deeply rooted in jazz tradition. Rick has a way of playing that makes one listen carefully to him." 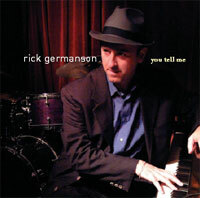 Rick Germanson "You Tell Me"
There is an appealing heaviness and density to Rick Germanson's playing that represents yet another distinctive, valid approach to the infinitely variable art form of the piano trio. Very little here is suitable for late-night contemplation and consolation. Instead Germanson offers serious chops humanized by the infectious pleasure he takes in the creative pianistic process. He also compels the listener's full attention with his thick chord voicings, irregular phrasing and fresh takes on group form. Two factors that enhance the realization of You Tell Me are the sidemen and the recorded sound. Bassist Gerald Cannon's groove is deep but sophisticated, and drummer Ralph Peterson is a lashing whirlwind of polyrhythms. The sound, by engineer Mike Marciano, is close-focused and dynamic. Germanson writes interesting tunes, some dark (the churning "Entropy," the incantatory "Dance of the Forgotten"), some light (the exuberant vamp "Theme for Eliot," the harmonically and metrically ambiguous "Erika's Endeavor"). His standards are nonstandard, such as "It Was a Very Good Year," which becomes a fast off-kilter waltz with a ferocious Peterson drum break and is utterly without its usual wistfulness. The two nominal ballads, "Angel Eyes" and "Born to Be Blue," are hit hard enough to sustain the album's sweeping urgency. "Germanson is the star of the record, constantly surprising with his inventiveness...the closest comparison I can think of is Teddy Wilson, who spun pearls...Germanson, who is deeply living the tradition..."
With You Tell Me, Rick Germanson has created an immensely satisfying piano trio album in which the musicians engage the compositions, and each other, with mature dialogue, wit, and extroverted passion. To top it off, the music swings like crazy. Germanson exhibits a roiling swing and a steady flow of solid ideas. He favors dense chord voicings, coupled with a scampering right hand, and his overall approach bears a superficial resemblance to that of McCoy Tyner or Kenny Barron. But Germanson likes to improvise with unpredictable phrasing, using some short phrases and riffs to build tension. And amid the urgency of his playing, it also has a joyous quality. Germanson obviously loves to play and he loves to swing. The momentum of the piano solos is enhanced by Gerald Cannon's deep bass groove and Ralph Peterson's superlative drumming. Cannon's deep, woody sound and in-the-pocket walking are invaluable to the success of this music, and he locks in with his bandmates most effectively. His solos are excellent, and of course, he swings hard. Peterson is simply spectacular. He sets off fireworks, constantly pushing the music forward, and playing dense polyrhythms that swirl around the groove without ever detracting from it. He can follow Germanson's lead, or he can engage in complex, creative crosstalk with both Germanson and Cannon. And his brushwork is exquisite, particularly on "Dance Of The Forgotten." Besides the strong playing by all hands, You Tell Me benefits from Germanson's inventive compositions. "Entropy," for example, is an uptempo cooker with a catchy melody. "In The Cut" is a solidly grooving blues. "Dance Of The Forgotten" is another cooker, a waltz with knotty harmonies and the rich chordal voicings in which Germanson maneuvers so adroitly. With its superior improvising, impressive selection of tunes, often compelling sense of interplay, and hard and happy swing, You Tell Me has it all. "If the past is prologue, then the future is unlimited for Rick Germanson. After planting solid classical roots and wood-shedding in strictly jazz literature, the Milwaukee native made all the right moves, switching from the Big Cheese to the Big Apple. That was six years ago, during which he played and recorded with all the right people. Now, at 30, his chops are ready for his CD debut as a leader: Heights (Fresh Sound New Talent). He's blessed by tons of technique, taste and a clarity of right-hand runs, an appreciation for complex rhythms and a love for Latin. (Check all those blessings out on "Tune Up".) 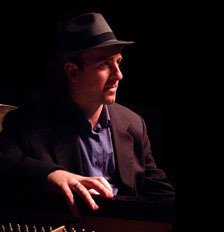 He can handle supersonic speeds ("Lover"); write a love poem in 3/4, with "Susan's Waltz"; cleverly disguise "I'll Remember April" as "April Mambo"; and show writing chops as well as montuno moments during his "Game Theory" with the help of very supportive friends: trumpeter Brian Lynch, bassist John Webber, drummer George Fludas and percussionist Luis Diaz. 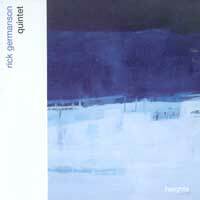 "...featured strong solos from pianist Rick Germanson." "The pianist, Rick Germanson, is also rapidly developing into one of the most harmonically and rhythmically advanced on this particular scene." 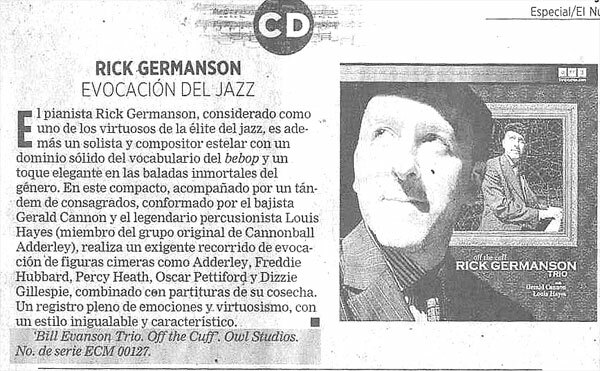 "...Germanson shows intelligence and individualism in his own playing.He manages to generate a double-tempo solo that sound simultaneously spacy. He shows how to swing as the rhythm section evolves the cooking groove of "Lover" while he takes amore laid-back approach to the waltz in the sensuous solo piano preamble to "Susan's Waltz" while the sophisticated vamp of "Smokehouse Blues" showcases his quintet at it's most compelling. Germanson's approach to Monk's "Pannonica" is most unusual as he has re-harmonized it as mellow Latin variations promising the intriguing potential of future projects." "...Germanson has matured into a musician who favors melody as the string holding together all of the tune on "Heights" (FSNT 155). Without ostentation and with clearly conceived logic throughout the tracks, Germanson makes clear to his listeners the narratives of his music. Indeed, one of Germanson's trademarks seems to be his transitioning between tempos to add interest to his arrangements. "Heights" introduces a jazz pianist who has paid his dues backing up a long list of jazz artists. Germanson has grown into an artist who is as comfortable accompanying a lead musician as he is performing his own music with clarity and grace." "...features great work by pianist Rick Germanson"
"Pianist Rick Germanson performs with delicate grace...using just the right touch to evoke a variety of textures." "Pianist Rick Germanson gets his moment on the Bobby Timmons classic 'Dat Dere." "Rick's next CD should be entitled "He Plays a Mean Piano!" "Germanson contributes a lot of elegantly muscular piano." "Pianist Rick Germanson turns in a performance worthy of the great Ocsar Peterson"
"Pianist Rick Germanson shows extraordinary invention and range..."